Only just recently have I gotten back into a mood of putting my records on and letting them play, (in reality it is my iTunes collection of music playing from my iPod or laptop) I can’t even remember the last time I played an actual cd and let the music fill the spaces and hallways of my house. I have to confess it’s always been a secret wish or unfilled dream of mine to have a collection of vinyl records and a vintage record player. I was heartbroken when I had to let go of my mothers collection of vinyl records. She must have started her collection from when she was a teenager or in her early twenties- I remember seeing a lot of Nat King Cole and Bing Crosby. She brought them all the way from London to Cayman. Unfortunately her collection was ruined after hurricane Ivan (2004), and it was only just last year I finally parted with them. There was no way to restore them. I just had to let them go. I know it sounds silly to some to be sad over material things, but it was more the sentimental element of it all that hurt. I kept thinking how those records were a part of my mom in some way, as they captured a time in my mothers life when obviously I didn’t know her. I always wondered how much those albums might have meant to her, as music has always meant something to me. For me, music has been a solid ground to fall onto when the world is spinning madly around in circles, or a safe haven to come to when you can’t carry the heaviness anymore, and on other days it is a beacon of hope and inspiration for creativity, writing and painting. Music can be a powerful thing, the first song you listen to in the morning carries a lot of weight, it can set your mood for the whole day, and sometimes the last song you hear for the day can encapsulate a lifetime of experiences and emotion. Though I may not have my mothers collection of records anymore or even a vintage record player for that matter, I do have a vinyl record. One that has been repurposed! So its an eco art piece. I came across it some years ago, a Junior Achievement group had bought unwanted vinyl records from the Humane Society Book Loft and turned them into clocks- a pretty neat idea. 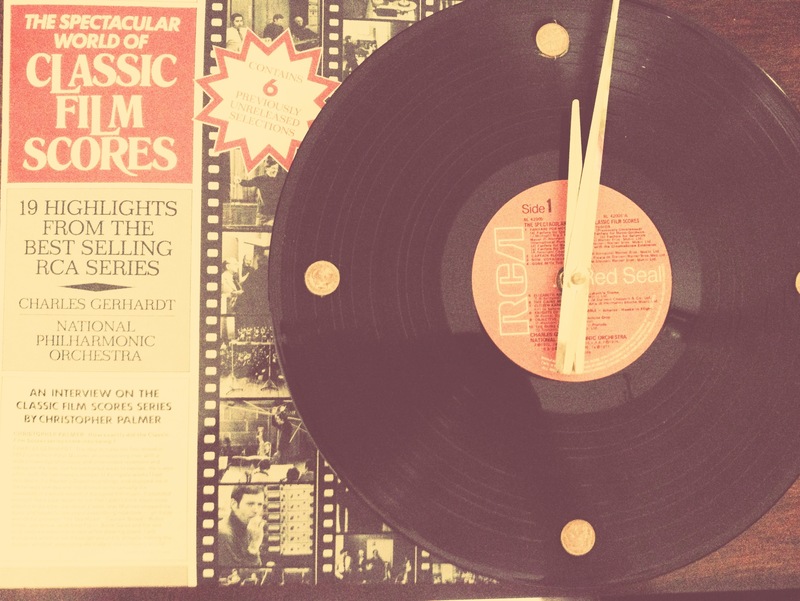 I bet some of you who are still holding on to your cherished record collection are cringing at the thought of a vinyl record no longer being played on a record player, but instead being stripped of its music to be hung on a wall as a clock. It’s not so bad, think of it as a way to preserve a vinyl record which you can’t bare the thought to part with. My vinyl record is one that once gave a voice to Classic Film Scores, perfect for me as a absolutely love classic movies, silent films and black and while films. One of the tracks was from an all time favorite film of mine, Sunset Blvd. As every song must reach the coda and fade away, your vinyl records will succumb to the day that they can no longer play on that old record player and you may want to consider repurposing that record into an eco art piece, maybe as a clock, or as a framed work of art on the wall. Whatever, you decide the memories will live on and you can always download the songs from iTunes (though it won’t be the same experience playing music from a cd player or iPod) Long gone are the days that those now old audio cassettes stopped playing, as cd’s became the new thing, and slowly cd’s are transitioning into what vinyl records are for some people, as the iPod is taking over. I guess for me my cd collection is my vinyl record collection. Some great albums I just can’t part with. For all you music lovers, that play vinyl records, cds or your iPod enjoy your day and may you still continue to stumble across some incredible new music and artists out there in the sea of songs, lyrics and melodies. If you have a moment take out those old records and let them play. Just a random note, the APP Store actually has an app that imitates a vinyl record player from various eras, its pretty neat. P.S.- What are some of your favorite songs, albums or artists that you have on vinyl records or as a part of your music collection?